We are the best signal provider for forex traders who likes to trade spot gold. We have a lot of good customers' feedback and we are happy to help forex traders to trade spot gold the right way and make money. Good Job Man, Keep it up. Thanks for helping traders in successful trading. Gold trading appears to be more tricky as compared to other instruments, so a helping hand does the magic. I asked them about there draw down and SLpolicy, and they answered it was usually around 120pips, but almost never hit the SL. I MADE THE MISTAKE OF BELIEVING in them, July 11 he asked me to buy gold around 1359 and a stop of 1338, when I saw this big SL I asked them and they said its just for security, but they wont let it hit the SL, and that's the only truth they said, then another sms/ email was received, the gold started to go against them and moved the stop 1328, 1318, 1308, until 1305, almost 600pips, as I saw this I asked for a refund and was completely ignored, my advice is to STAY AWAY from these scammers, I think he trades on a demo account and just benefits from us the people. By the way, I tried to contact them at the given phone number which is out of service, only contact is through email. stay away ! Underwhelming, simplistic daily analysis written in pigeon English making it is often less than straightforward to decipher what should be clear buy/sell signals. More importantly, since subscribing a month ago the service has produced only loosing signals, currently -2600 pips in the previous 4 weeks as recorded on goldsignals own website. I also note that goldsignals stopped updating this online statement two weeks ago with the result that there are additional loosing trades not yet shown. Being only a recent subscriber I am not in a position to challenge directly their historical claims, but on the basis of this poor analysis, lack of performance and the non publishing of the last two weeks loosing trades I would I can only conclude that the performance data shown in their promotional literature is not reliable. I will not be continuing with the service. Mr David, as other memebers told, it's a honest person. and also a good trader. he uses everything you need to start a good trading. there is Stop Loss there is take profit he takes care of fundamental and also resistance and support levels. he is always available and his performance it's true. he helped me with my account balance. I made 1500€ of profit with 6000€ account balance. it's good. I'm not so newbie I studied trading for almost 3 years and I'm still learning. but if you are new on forex or experienced trader you can diversify your portfolio with this good signal . I Have been a subscriber of GoldSignals over 3 months (VIP Trend), by far the best signal provider I have ever used. Performance shown in his website is exactly what We make. Support given by provider is amazing, You are really treated as a VIP. Signals are sent by SMS and Email, and You are always updated by one of those means. David is a professional, a specialist in Gold trading, so if you want success in this market You know who to look for. 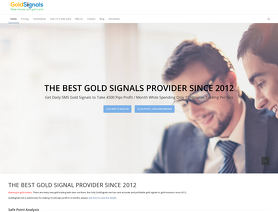 I am very happy with this signals service, David is a very honest and helpful person. Even if you are paying only for a signal service only, he will take care of begynners and will help you in your trading efforts. He uses Ichimoku and candlesticks and I quickly learnt how to trade for my self using his methods. Supeb service. I recommend it to everybody interested in trading gold or trading in general.